The Maresh Red Hills Vineyard is one of the most acclaimed vineyards in the Willamette Valley. In 1959 Jim and Loie Maresh purchased property in the Dundee Hills on Worden Hill Road. The first vines were planted in 1970. Only David Lett’s Eyrie Vineyard in the Dundee Hills was planted earlier. 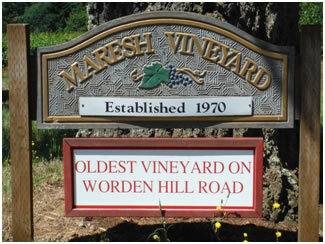 The Maresh Vineyard is the fifth oldest vineyard in Oregon and the oldest on Worden Hill Road. The vineyard is primarily planted to Pinot Noir, Chardonnay, Riesling, Pinot Gris, and a little Sauvignon Blanc. It has always been dry farmed with emphasis on low yields. Over the years Maresh Vineyard grapes have produced outstanding Pinot Noir wines made by many well regarded Oregon wineries. In 2014 Jim and Loie Maresh were inducted into the Oregon Wine Walk of Fame located at the Dundee Bistro Restaurant. Their names will join a distinguished list of individuals previously honored by industry peers and commemorated with plaques affixed to the walk. In February 2015 Jim and Loie Maresh were also awarded the Oregon Wine Industry’s Founder’s Award which was presented at the Industry’s 2015 awards dinner.